Russian avant-garde artist Kazimir Malevich's famous Composition 3k has sold for £52,500 ($80,000) at Bonhams in London, more than five times its pre-sale estimate. The famous pencil drawing, composed on a sheet of graph paper by Malevich in his studio in 1915, went under the hammer at Bonhams' Impressionist & Modern Art sale, February 3. 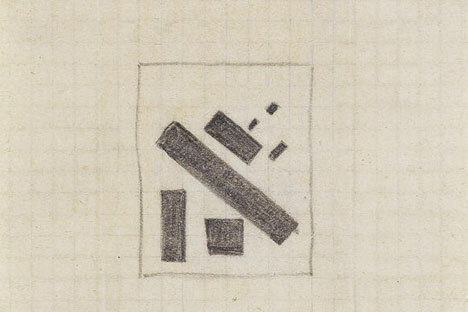 Considered one of the artist's first abstract compositions, it was drawn during a period when Malevich, best known for his Black Square, was beginning to concentrate on the geometric paintings that became the hallmark of the Suprematism movement. The sale's most expensive lot was Les promeneurs by Henri Rousseau, which sold at six times its estimate for £362,500 ($550,000) including premium.